RUMOR: Leaked GameStop Poster Reveals Wii U Release Dates? So you know how rumors work right? They are meant to be discussed and not taken very seriously. 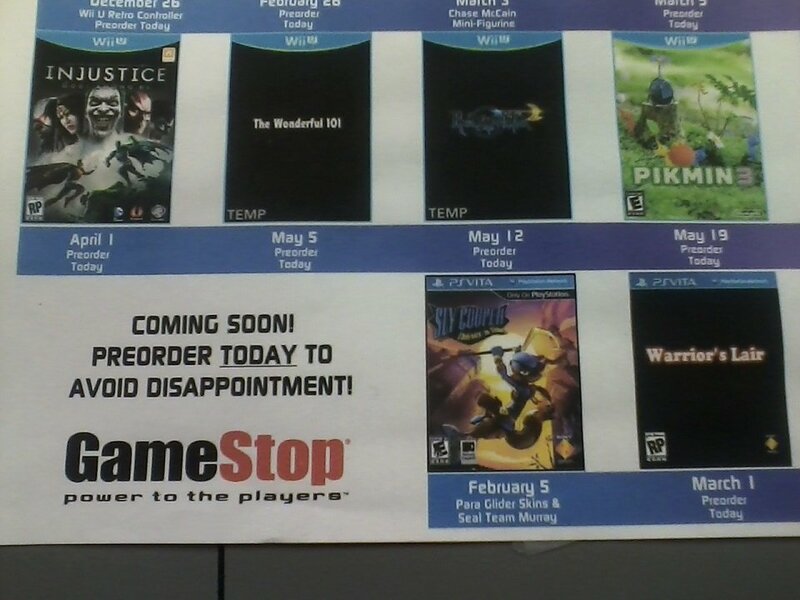 This is an image of an apparent leaked GameStop advertisement showing the release dates of some upcoming Wii U games and two PS Vita games. There are a couple of things to take note of. The Sly Cooper release date is accurate, but that does not mean a whole lot of anything. Nearly all of these release dates are quite close to the placeholder dates GameStop already has in their system. In other words, these are likely nothing more than placeholder dates and GameStop is simply trying to encourage pre-ordering without having any kind of insider knowledge on when the games will release. As one of our other writers pointed out to me, we have heard very little of Bayonetta 2, nor on a couple of the other games, so a release anytime soon seems unlikely. Either way, I still thought it was interesting enough to share with everybody as I know many of you are looking forward to these games. So discuss, agree, disagree, but don’t take it as fact. In the mean time, why not take the advice of GameStop and pre-order the games? You can Pre-order a few from Amazon as well if you prefer.